We'll first want to set up our project so that our video can be used in a DVD format, which means that we need to change the dimensions and the frames per second appropriate for either NTSC or PAL. Let's go to Image, then Dimensions, and select 720 x 480 pixels, for NTSC, or 720 x 576 for PAL. Then select OK.
Next, change the frames per second. For NTSC, it is 29.97 fps and for PAL it is 25 fps. For this project, the animation is going to last 6 seconds. So for NTSC we'll need 180 frames and for PAL we'll need 150 frames. 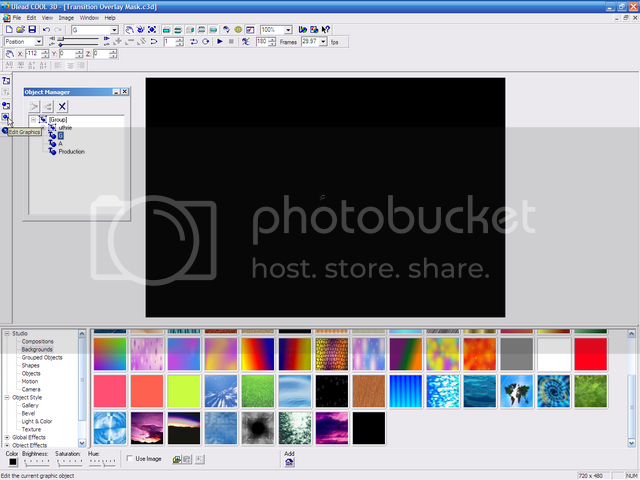 Next select View, then Object Manager. This will allow to us to manage the objects that we'll be using in our project as you'll see later. Now, press CTRL+S and save the project with the name "Transition Overlay." It's a good idea to periodically save your work, just in case the unfortunate happens. OK, let's now begin our design. When we design our graphic, we'll want to use something that will allow our transitioning video to be seen through a portion of our 3D asset. Essentially, anything with a hollow area can be used. It can be a circle, a square, a custom logo, or maybe even part of a letter in text. For this particular 3D project, we're going to create an opening sequence for a video with a customized logo that says "A 'your name' Production." We'll use this 3D overlay not only for an intro, but also in the middle of a video since the technique is just a little different. So let's begin by selecting the Insert Text icon. Next, type in your last name. Now, use your mouse to highlight your name and click on the drop-down box for the font-face. Instead of using our mouse to select the font though, let's use the down arrow keypad. 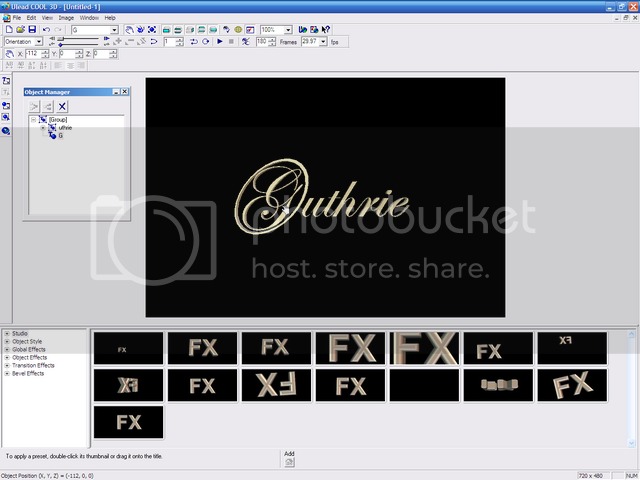 This will allow us to see our name in the actual font, thus making it a lot easier to choose a font that we like. I chose Edwardian Script ITC. Also, let's change the Font size to 30. 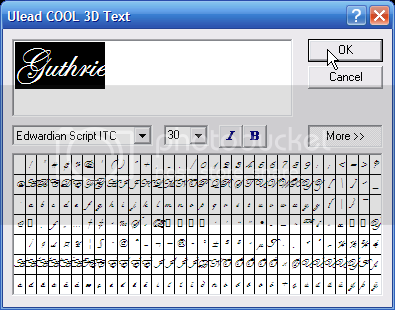 Now select OK.
Ron wrote: If you don't have Edwardian Script ITC, just use any script type font. Let's next select Edit, then Split Text. If you look at the object manager you'll notice that our letters are now individual objects. This means that we could apply different effects, such as texture and motion to each letter, but we're not going to do that. Instead, we're going to enclose the first letter in an ellipse and I first wanted to be sure that our name was centered perfectly. OK, so let's group the rest of the letters together. Shift-click the second and last letters of your name. 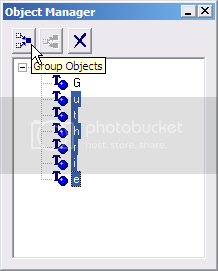 Now click the Group Objects icon and next click on Sub Group1, which is our newly created subgroup, and rename it with the remaining letters of your name. This will help identify our object group easier if we decide to add other object groups to the project. OK. Now let's create the ellipse around the first letter of our name. Select the first letter in the Object Manager and then click the Edit Graphics icon. Select OK on the warning screen that tells you that the text will change to a graphic object. Now you'll see the Path Editor window. Notice that the letter is centered on the screen, and that there's also a small red cross-hair. 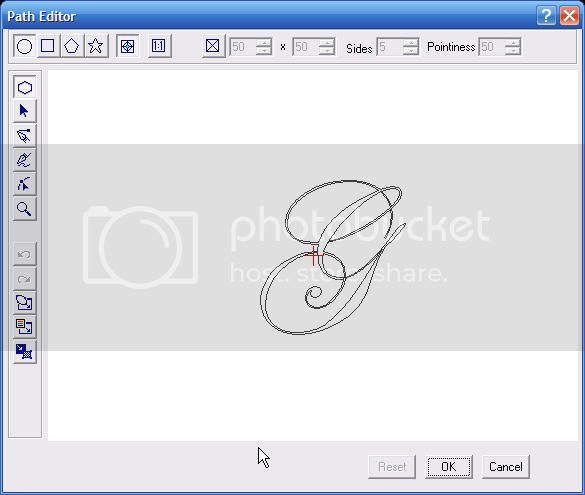 Ron wrote: This cross-hair is the center pivot point for the object you're creating or editing. This is important because it effects how an object rotates. For example, if we rotated our object now it would spin in place like a stationary globe since it is centered on the cross-hair. If we move the object away from the cross-hair, it will orbit around the imaginary pivot point of the cross hair. If we need a larger orbit, then we just need to move the object further away from the cross-hair. We won't be using any rotation today, but I thought you should know this in case you'd like to use this in a future project. OK, so for our letter, let's create an ellipse that will enclose our letter. 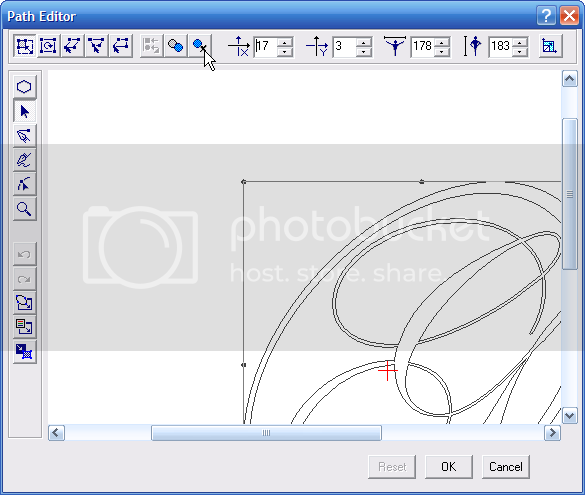 Notice that the ellipse shape is selected by default when we start the path editor. 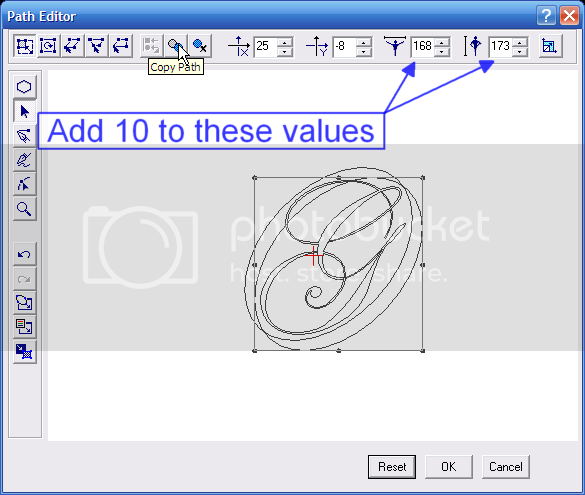 Click-drag an ellipse starting at the center of the cross-hair until it is just big enough to enclose the letter. For my letter, I'm going to create more of an oval rather than a circular shape. Also, I'll need to rotate the oval so that it fits better around my letter. To do this, I'm going to select the Object icon and then click the Rotate icon. I also moved my oval into a better position by clicking on the Resize icon. 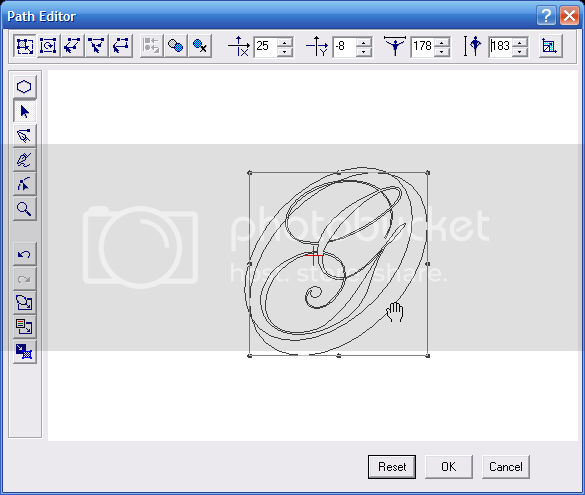 Next copy the ellipse by selecting the Copy Path icon. Notice that the copied path is offset just a little from the original path. We'll center it in a moment but let's first resize the copied path by increasing the Width and Height values by 10 each. Now move the cursor over the copied object until it turns into a hand and move the copied path so that it aligns with the inner ellipse and select OK.
Now that we have an ellipse around our letter, which I'll refer to as our letter graphic from now on, you'll see that it overlaps part of the rest of our name, so let's move it a little to the left. Select the Move Object icon. Now adjust the x-axis value to move the object. We could just type a number in the x-axis box, but instead we're going to move the letter with our mouse. This will be easier and much faster. While pressing the SHIFT key, move the mouse to the left until the letter no longer overlaps. Ron wrote: Pressing the SHIFT key while moving our mouse left or right constrains movement to only the x-axis. If we were to hold the SHIFT key while moving the mouse up or down, we'd then be constrained to the y-axis. Let's save our project again by pressing CTRL+S. Remember, we want our overlay to say "A 'your name' Production", so let's add the rest now. Click the Add Text icon and before typing the letter 'A', change the Font to Arial and also change the Font Size to 15 less than the current value, then select OK.
As you can see, we'll need to move the letter A to above our name, so again, while pressing the SHIFT key use the mouse to move the letter 'A' upward. Now, add the word Production, and move it below your name. 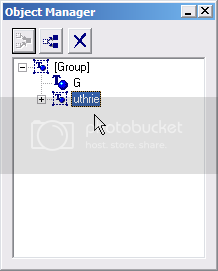 Click on the Group icon in the Object Manager. This will allow us to control the entire group of objects, which is a huge timesaver. 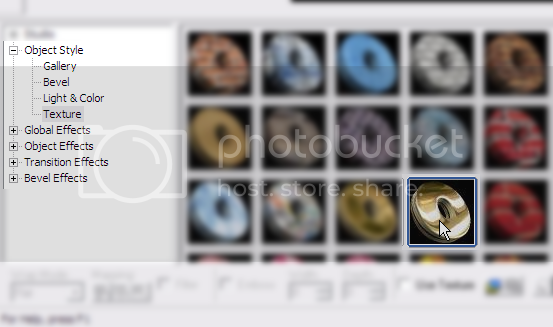 Next, let's apply a Texture to the group from the EasyPallete by double-clicking on a gold texture. Let's also chose a round Bevel. Now make some adjustments to the bevel so that it looks nicer. Change the Depth from 75 to 20 and the Precision from 3 to 9. OK, now let's add some motion to our transition overlay. For this project we're going to have the objects zoom in from the background for 2 seconds, pause for 2 seconds, and then zoom towards us for 2 seconds. Since our video will show through our letter graphic, we'll also need to change the group's position on the x- and y-axis at the last part of the animation so that the letter graphic will end up being centered on the screen (and not our name). Before we begin adding keyframes, let's ensure that Position is selected. Now let's start adding some key frames. In the Current Frame box, double-click and type 60 (PAL: 37) and press ENTER. 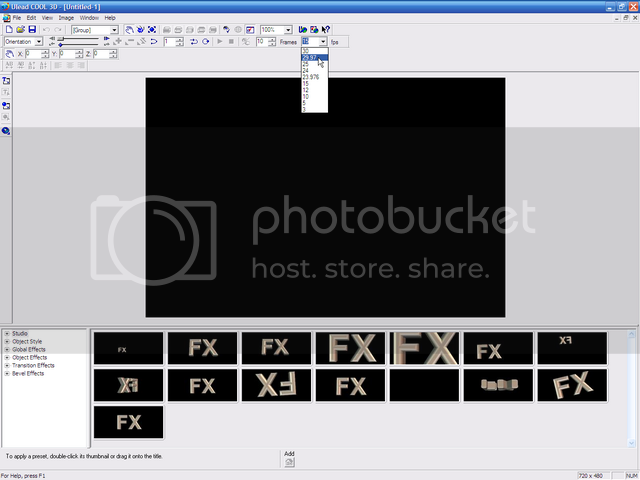 Now select the Add Key Frame icon. Let's do the same thing to add a key frame at 120 and at 180 (PAL: 112 and 150). OK, we can see that we now have four key frames. Click on the first key frame and let's move our group on the z-axis using the mouse. 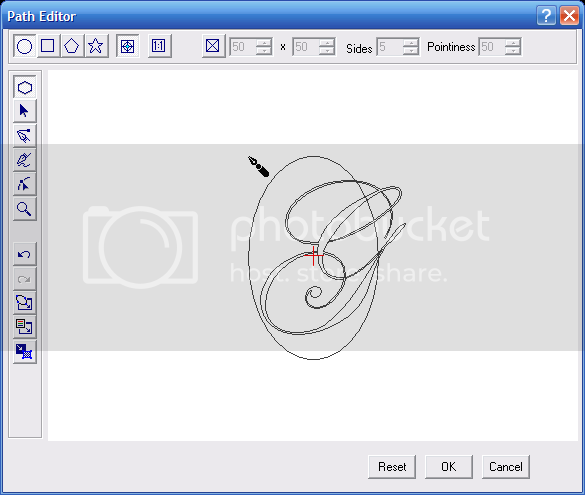 To do this, hold down the right mouse button and move the mouse using upward strokes. Once the graphic is very, very tiny, you'll notice that the x- and y- axis have not changed and the z-axis is about 10,000! OK, let's finish our animation. Ron wrote: Wouldn't it have been easier just to add 10,000 in the z-axis box and press ENTER? Yes! But I want you to get familiar with using the mouse to control the movement. In the long run, it's more intuitive and allows quicker control (and feedback) of your object's movement..
Click on the last key frame, which is at 180, and let's change the position of our graphic so that it will be zoomed towards us and off screen. First, use the right-mouse button and use one downward stroke to bring the object closer to us. We'll now want to change the x-axis of our group so that our letter graphic is centered. So, using the SHIFT key plus the left mouse button, center the letter graphic on the screen. OK, let's click the Play icon and watch our animation. Now let's press CTRL+S to save the project. Now we'll render our project as a 32-bit .avi file. This will provide us with an alpha channel, which essentially means that our black background will be invisible in the resulting video file as you'll see later. 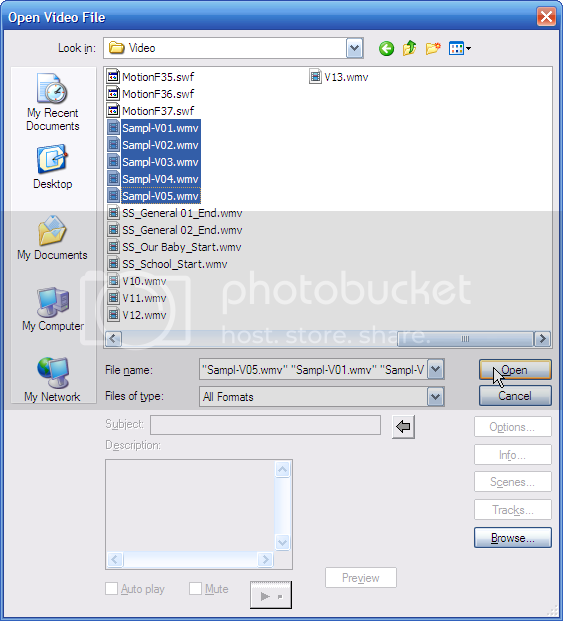 Select File, Create Animation Files, and Video File. 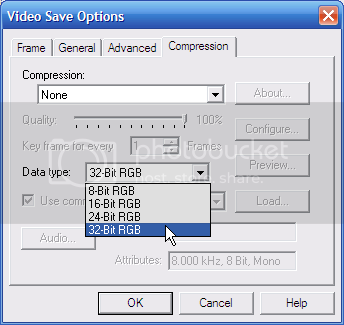 Next select the Compression tab and change your settings so that Compression is set to None and the Data Type is set to 32-bit RGB and select OK.
Now name the file "Transition Overlay" and select OK. Depending on your system and you current settings this should take anywhere from 3 to 12 minutes. So take a break you deserve it! Ron wrote: If you're asking, "What settings?" I'll explain that now. Cool 3D allows us to choose the quality of our output. This is important because if the project is designed for the Internet, we may want to sacrifice some quality to achieve a smaller file size. These settings are Display Quality, Object Quality, and if you're using a Bevel, Precision. Display Quality is self explanatory; it determines the quality of how your objects are displayed. The lower quality, the faster the display should be, sort of. It also relies on your object quality. Object Quality determines the accuracy of the "math" to draw the objects. Let's say we're calculating numbers. 4 x 3 =12, whereas 4.113 x 3.765 = 15.485445. That's a big difference! So much that it can make the difference between rendering an oval and a dodecagon (a 12-sided plane figure). Precision is found as a property in Bevel. Again, it's the accuracy of the math. A more accurate bevel will have sharper, more defined cuts, whereas Draft quality will have smoother, less defined cuts. Think of it as an apprentice carver versus an expert carver. So, why does all of this matter? Well, while you're working on your project, you may want to sacrifice quality, in particular Object Quality, for a faster screen rendering. 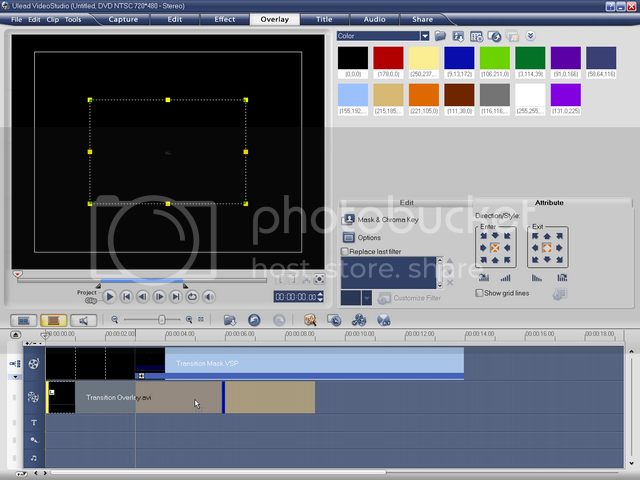 Then when you're ready to render your final product, change the quality to Optimal and Precision to 9. Depending on your project (and your computer), be prepared to take an extended coffee break! Now we're going to create an animated mask from our project which will be used later in VideoStudio. So now select File, then Save As and name the file "Transition Overlay Mask". Since we watched our video, our current frame position is at 180, so let's click on the first key frame. Now for every object except our letter graphic, we're going to apply Hide to hide the object. 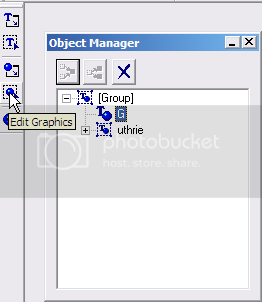 So in the Object Manager select one of the objects and then click the Hide icon. Do this for each object except, again, for our letter graphic. Now let's edit the letter graphic to create the mask. 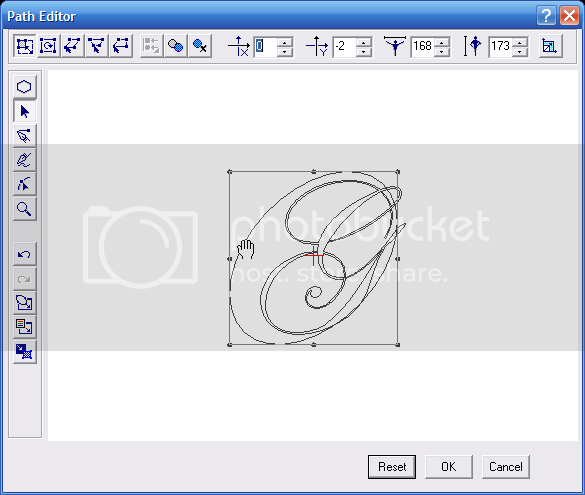 Select the letter graphic's icon in the Object Manager and select the Edit Graphics icon. 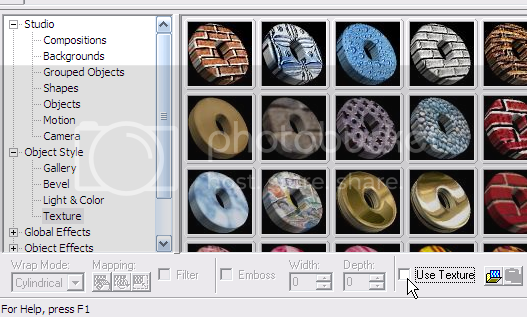 Now select the Zoom icon and click near the upper left edge of the graphic. This will help us select the paths that we want to delete. 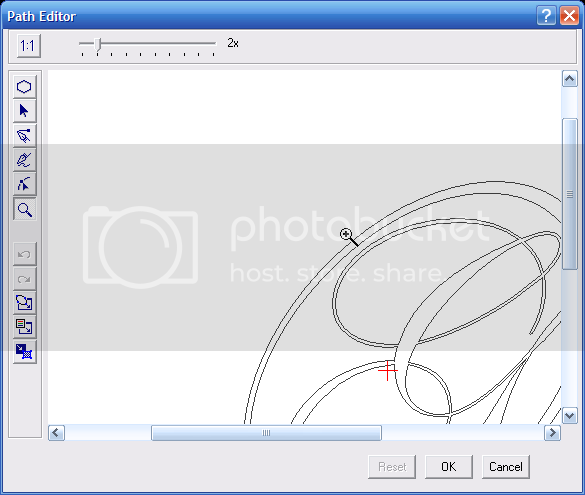 Now select the Object icon and delete the outer ellipse (it is selected by default) by clicking on the Delete Path icon. 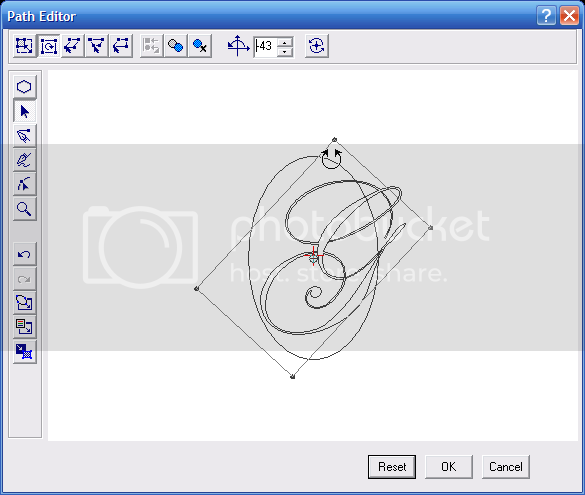 Notice that as you move the mouse close to each of the paths, that is, the inner ellipse, and the first letter of your name, you'll see the cursor change to a hand. Use this to click and select the letter path, then click on the Delete Path icon. You will have to do this more than once to delete all of the paths of your letter. Select OK when you're done. Ron wrote: Also, remember that if you make a mistake, you can press CTRL+Z to undo a change. 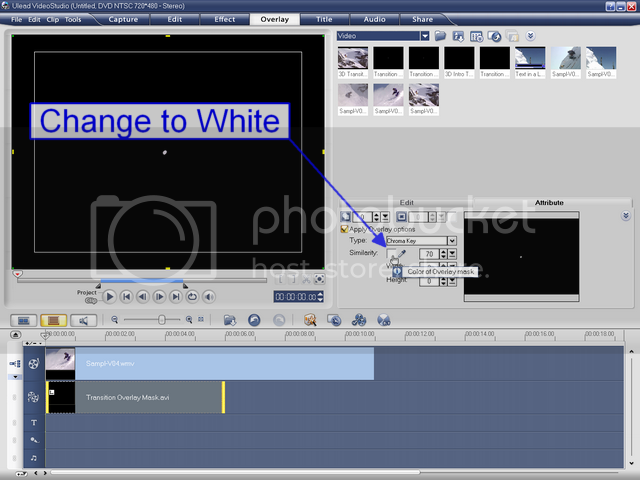 Now we're going to change our graphic so that it will act as a chroma color in VideoStudio. Make sure that your Current Frame is still set to 1. Now, let's remove the Texture by deselecting the Use Texture checkbox. Now let's change the Light & Color in the Object Style. For Surface Color, change it to White by clicking on the small color icon. Also change the color for Specular and Ambient lighting to White . Now deselect any light sources that are turned on. OK, let's save the project by pressing CTRL+S and play the animation. Notice that at the very end of our animation that the screen turns black, this is because our object has left the screen. We'll talk about this again in VideoStudio. For now, let's render our overlay mask. Select File; Create Animation Files, then Video File. This time we're going to save the file with the background intact, so we can use the default compression settings. Let's name our file "Transition Overlay Mask" and select OK.
Alright! We're done with the hard part! Let's exit Cool3D and start VideoStudio. 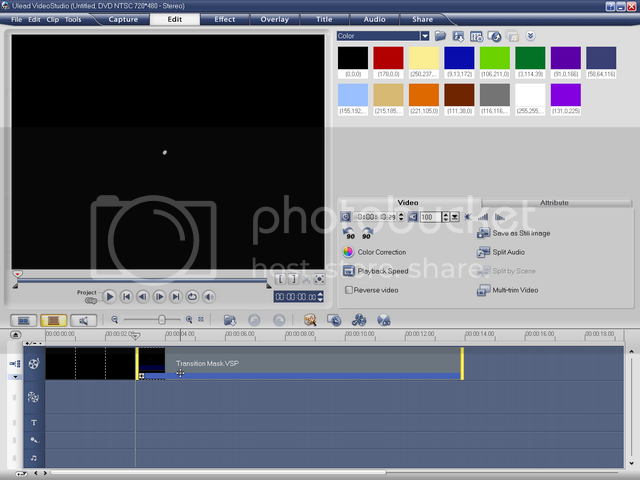 Unlike MediaStudio Pro, we can't use video mattes in VideoStudio. "So how can we use this fantastic effect" you say? We have something up our sleeve that's in the same ballpark - Chroma keying! While not as quick and easy to use as video matting, I've got another trick up my sleeve to help us out. So, what is it? It's Ron's Secret Power Tip! Ron wrote: And what is Ron's Secret Power Tip? 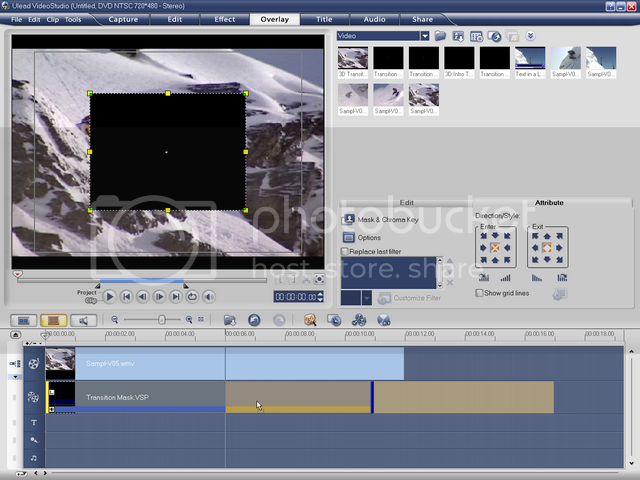 It's using VideoStudio's ability to use a VideoStudio (.vsp) file within another project. This allows us to do things that normally can't be done with VideoStudio such as text effects. 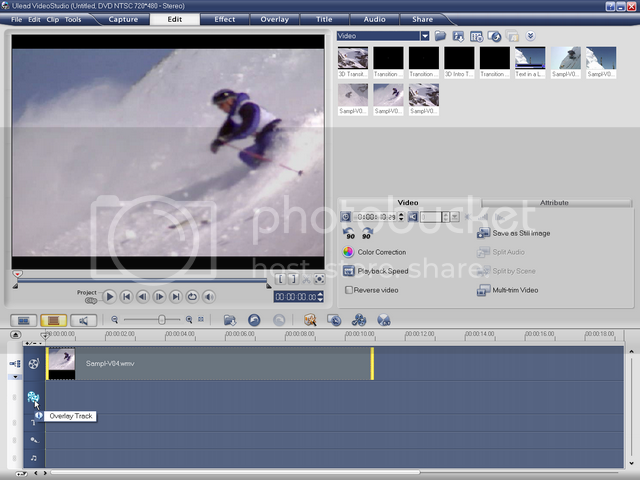 It also allows us to perform an action without needing to render a video file. So it's a time saver as well. We're going to be using our two animation files, Transition Overlay.avi and Transition Overlay Mask.avi that we created in Cool3D. Also, I'm going to show you how to use the 3D Transition Overlay as an introduction to your video and then in the middle of your project since each require a slightly different technique. So let's begin! First, we going to create a video that will use our 3D Transition Overlay Mask. This will be the video that we will transition into and will be seen through the 3D letter graphic, so it's important that it's longer than our 6 second transition overlay. 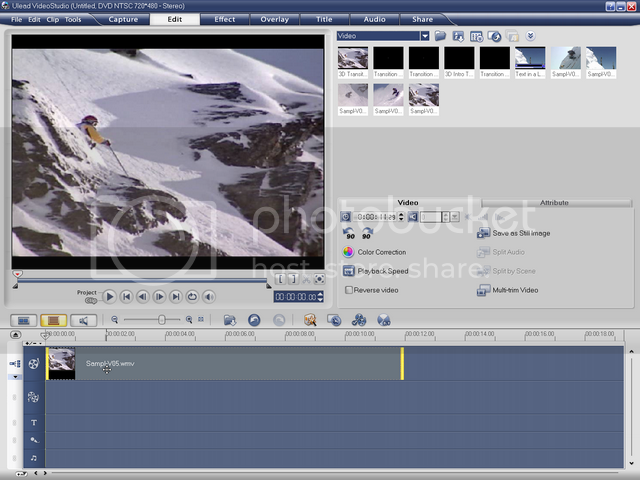 I'm going to use the video clips that are used in the sample project that comes with VideoStudio 11. Let's add these sample clips to our library now. 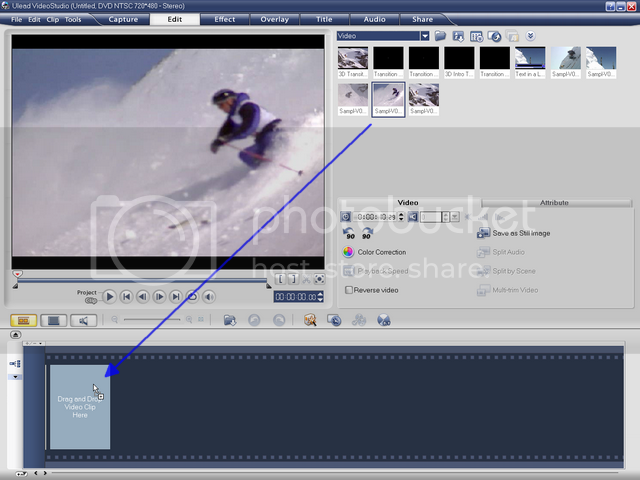 Click the Load Video icon and navigate to C:\Program Files\Ulead Systems\Ulead VideoStudio 11\Samples\Video. Now while holding down the SHIFT key, select Sampl-V01 and Sampl-V05 and press Open. Next, select OK on the Change Clip Sequence dialog box. 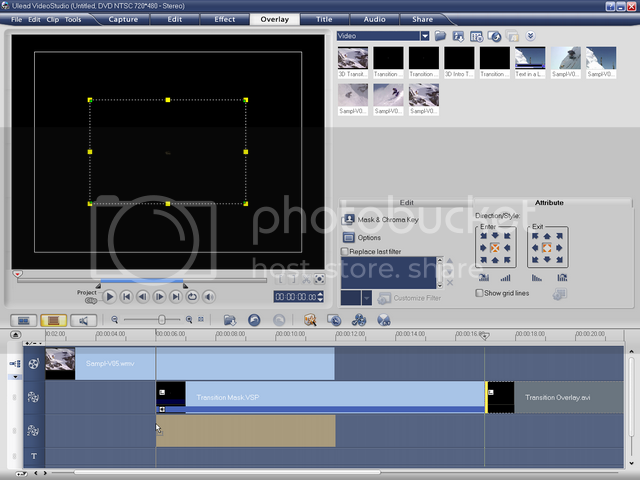 Now click on the Sampl-V04 clip to deselect the other clips and drag the Sampl-V04 clip to our Storyboard. Next, let's add our overlay mask. Click the Timeline View icon, and then click the Overlay Track 1 icon. This will allow us to add our next clip directly to the Overlay Track. 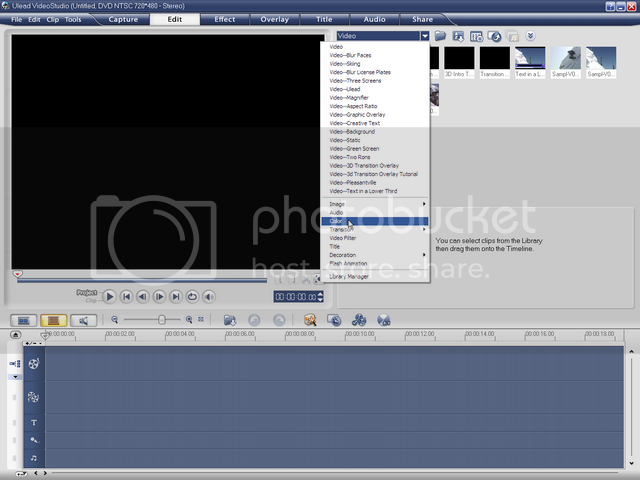 Now click the Insert Media Files icon, and select Insert Video .... 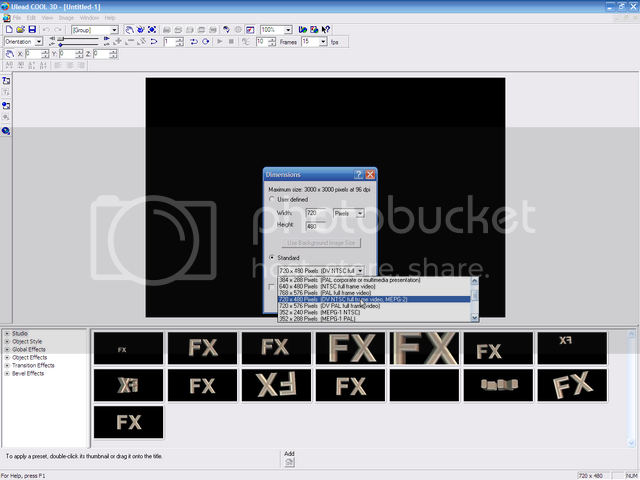 Select Transition Overlay Mask.avi and click Open. Next, right-click on the Preview Window and select Fit to Screen. Now select Mask and Chroma key. 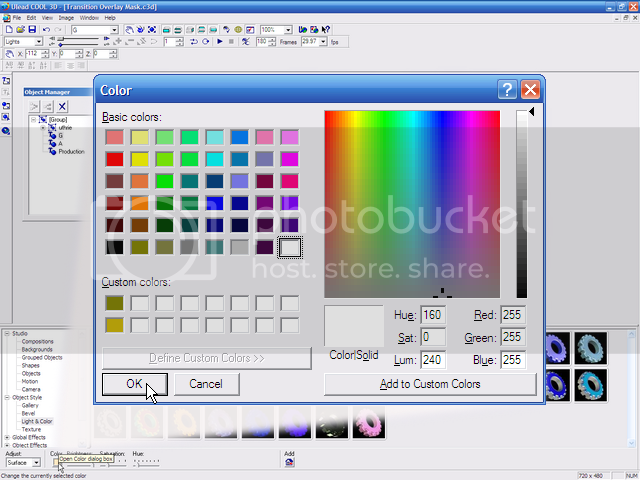 Select Apply Overlay options and change the Overlay Color to White. Now let's change to Project Mode by clicking the word Project (under the Preview window) and preview our work. Did you notice how the transition blinked right at the end (of the transition)? In case you missed it, play it again. This is because our mask zooms off screen like we discussed earlier in Cool3D. So what we'll need to do is trim a few frames from the end of the overlay mask. Let's go back into Clip mode by selecting Clip and select the Overlay Track clip. Now click the Edit tab and press the END key on your keyboard. This will take us to the end of the clip. Now, by clicking the Previous icon, let's go backward until we see the screen fill with our white mask. Now select the F4 key, which will markout our clip so that it ends here. This doesn't change the original video, just how we're using it for this project. Alright, let's save the project by pressing CTRL+S and name it Transition Mask. Now press CTRL+N to begin a new project. Let's first add a Black color clip to the Timeline. Go to the Gallery and select Color. Drag the Black color clip to the Timeline. Now click the Overlay Track icon. Next, click the Insert Media Files icon, Insert Video ... and select our 32-bit overlay video: Transition Overlay.avi. 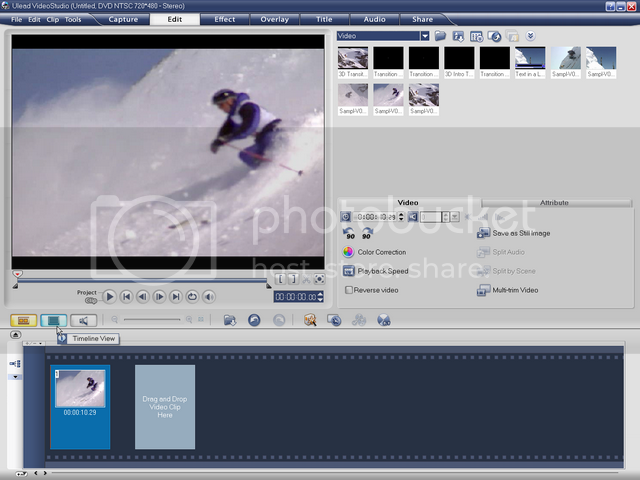 Next, drag the Transition Overlay clip to the right so that it aligns with our project clip on the Video Track. Press CTRL+S to save our project, and name the file "Transition Intro." And that's all there is to using this effect as an introduction! Press CTRL+N to start a new project. 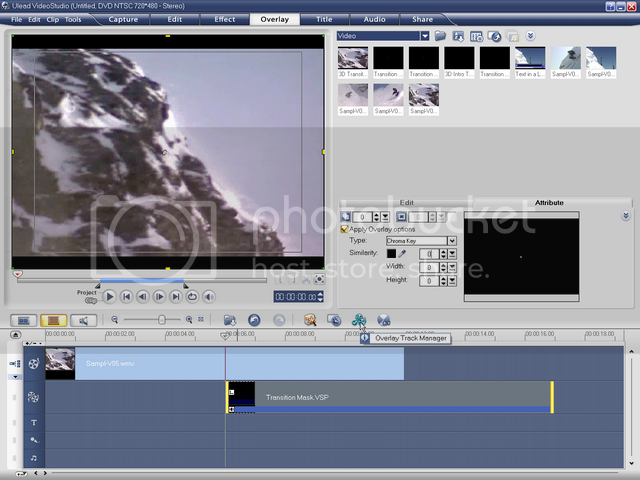 First, add the Sampl-V05 video clip to the Timeline. Now click the Overlay Track 1 icon. 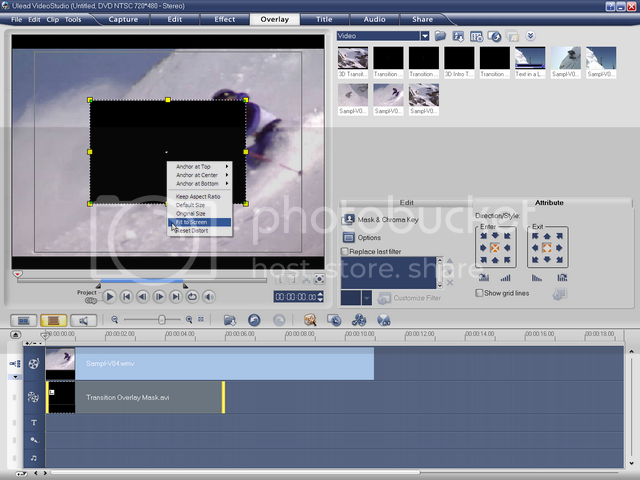 Click on the Insert Media Files icon, Insert Video ... and select the Transition Mask.VSP project. We'll now want to drag our overlay video clip so that we have a six second overlap for the transition. Remember that our 3D transition overlay is 6 seconds long, and in order to get a seamless transition from one video to another, without any black showing in the background, we need to use all six of those seconds! Since our underlying video, that is Sampl-V05, is 12 seconds long, we can move the transition mask so that it starts at 6 seconds. Now let's change the resize the clip to Fit to Screen and apply the Mask and Chroma key. In this instance, we'll want to keep Black as our Overlay Color and also set the Similarity to 0. This will confine our overlay color to pure black. 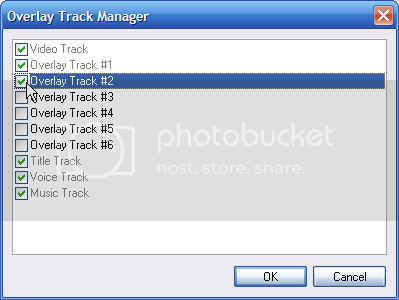 Now let's add another overlay track by selecting the Overlay Track Manager icon. Select Overlay Track #2 and click OK.
Now click the Insert Media Files icon and select our 32-bit overlay video, Transition Overlay.avi. You'll notice that it has been added to the Timeline on Overlay Track 1. Now you may wonder why I didn't have you click on the Overlay Track 2 icon and insert the video there. 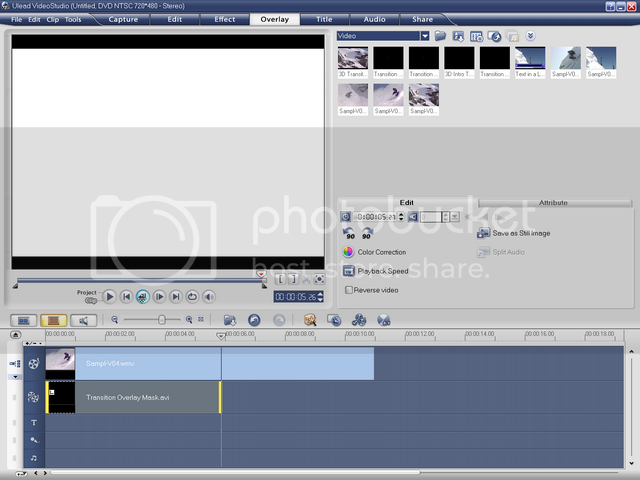 The reason is, even if we were to do that, VideoStudio would still insist on inserting the clip to Overlay Track 1. So we'll just have to move it to Overlay Track 2 and align it so that it snaps in place with the beginning of our overlay mask. Next, right-click on the Preview Screen and choose Fit to Screen. Finally, press CTRL+S to save our project, and name the file "Transition Mid." And that's it, we're done! I'd like to thank Ken Lowther at videographics.info for the idea for this project. Ken's tutorial, Graphic Overlay Video Transition, features Ulead's MediaStudio Pro and Cool 3D Production Studio, both of which are higher-end and more expensive products (about $400US together). With a little ingenuity and a different approach, we too can use this fantastic effect in our projects. 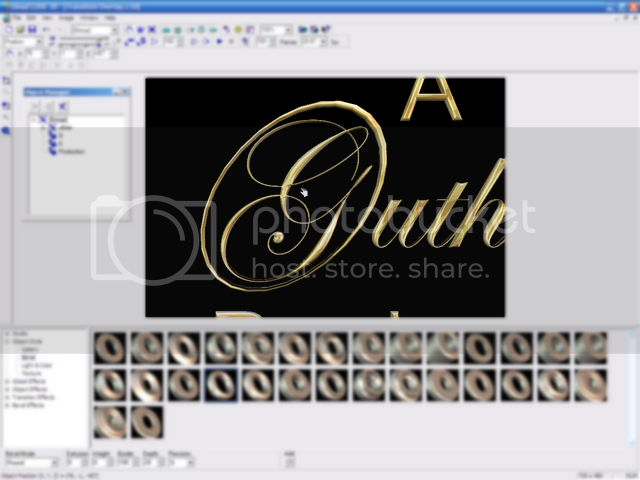 Also, see the video version of this tutorial at 3D Transition Overlay! I hope you've enjoyed this tutorial and that you've learned something that you can use in your future projects. Also, drop me a line and let me know what you would like to see in a tutorial. Until next time, have fun and be creative! Thanks for posting this. Corel isn't really pushing C3D like some other products. As a new VS X5 user, I need this. Good tutorial too. The reason for that is that C3D is a very old and discontinued programme. Thanks Don! It's nice to see this old tutorial still getting some mileage. Brian, looks like I need to update my tutorial! Thanks to both of you, Ronald and Brian. I'll explain myself briefly. I began working with CorelDraw 3 back in 1993 and began needing a little computer savvy about 8 years before (AutoCAD had just come out) when we could connect (by long distance) with a couple guys in CA who were busy creating the internet. I am by no means a pro but have experience with every version since and added Photoshop, Premier plus a few other creative apps along the way. I'm very happy that CorelDraw X6 (with the new PhotoPaint) addresses my needs in one package. I do keep an old Photoshop and CorelDraw 11 around... can't help myself. This is my first time in a real video studio program... yes I'm an amateur but learning the basics of the programs that got us here is important to anyone who wants to acquire and compile skills and really be good at this. Example: ProDAD Mercalli is capable of so much more than stabilization... I still have to learn it. I can't even remember the names of early programs that I tried for creation of 3D animation. Is there a way, through this forum to exchange videos for critique and comment? I'm a Marketing Director and live event producer/ director so am interested in production conversations as well. Thanks guys. The easiest way to post videos is to upload them to one of the usual websites such as video or YouTube then post a link here.